Shi-Yuan Cheng, PhD, professor of Neurology in the Division of Neuro-Oncology, was the principal investigator of the study published in Cancer Cell. Glioblastoma is the most common and aggressive type of brain tumor, with a particularly poor prognosis. Patients are treated with surgery, radiation therapy and chemotherapy, but there is no cure. Previous research has suggested that autophagy — a natural process of cell destruction that also plays a protective role under stress conditions — contributes to tumor survival and growth, and is induced by common cancer treatments, rendering tumor resistance to therapies. As such, there has been significant interest in inhibiting this survival mechanism. In the current study, the scientists sought to understand the molecular mechanisms regulating autophagy in the cancer, which could reveal novel targets for future treatments. 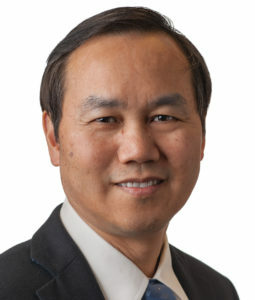 “Our findings solidified the concept of the promoting role of autophagy in malignant glioblastoma, and point out the necessity of specifically targeting autophagy in combination with first-line treatments — like radiation — for glioblastoma and other tumors,” said principal investigator Shi-Yuan Cheng, PhD, professor of Neurology in the Division of Neuro-Oncology, and a member of the Lou and Jean Malnati Brain Tumor Institute at Northwestern Medicine and the Robert H. Lurie Comprehensive Cancer Center of Northwestern University. In the study, the scientists first established that a protein kinase called MST4 plays a tumor-promoting role in glioblastoma. They then identified, for the first time, the substrate of MST4, called ATG4B, which mediates MST4’s tumor-promoting role through increasing autophagic activity. The team further demonstrated that radiation induces MST4 expression and ATG4B phosphorylation, thus promoting the autophagy process that contributes to tumor survival. Finally, the scientists investigated the effect of an inhibitor of ATG4B in a brain orthotopic xenograft model of glioblastoma. They showed that when used in combination with radiotherapy, the inhibitor significantly slowed tumor growth and increased overall survival rates of tumor-bearing animals. “We identified a pro-autophagic signaling axis in glioblastoma, whose pharmacologic inhibition enhances the anti-tumor activity of radiation,” Cheng explained, noting that the findings have the potential to be translated into clinical treatments. Cheng was also co-author of a separate study, published in Nature Communications in November, that identified a protein called TRIM24 as a transcriptional co-activator in glioblastomas driven by mutations in the gene for epidermal growth factor receptor (EGFR). The paper suggests that TRIM24 may be a potential therapeutic target in such cancers. The Cancer Cell study was also co-authored by first author Tianzhi Huang, PhD, a postdoctoral fellow in Cheng’s lab; Roger Stupp, MD, chief of Neuro-Oncology in the Department of Neurology; C. David James, PhD, professor of Neurological Surgery and of Biochemistry and Molecular Genetics; John Kessler, MD, the Ken and Ruth Davee Professor of Stem Cell Biology; Craig Horbinski, MD, PhD, associate professor of Pathology and Neurological Surgery; Bo Hu, PhD, research associate professor of Neurology in the Division of Neuro-Oncology; and Cheng lab members Angel Alvarez, PhD, Xuechao Wan, PhD, Xiao Song, PhD, Yongyong Yang, PhD, and Namratha Sastry. The study was supported by National Institutes of Health grants NS093843, NS095634, CA158911; a Brain Cancer Research Award from the James S. McDonnell Foundation; L32 MD010147 and T32 CA070085, CA163205, CA175875, NS083767, CA159467, NS080619, NS081774, LM012011, LM011673, CA155764, AA021751, and the Lou and Jean Malnati Brain Tumor Institute at Northwestern Medicine.